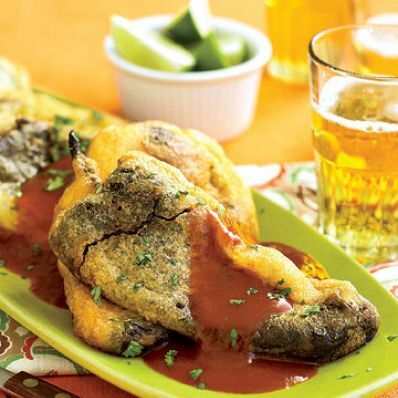 The key to success with this favorite Mexican recipe, is to fry the cheese-stuffed peppers until the outside is crisp and golden and the cheese inside is melted and gooey. 2 of 7 Transfer chiles to a bowl; cover with plastic wrap. Let rest 5 minutes to soften. Uncover and cool to room temp. Peel skin from chiles, using a paper towel to help strips of skin separate from chile. 3 of 7 With small knife, cut a slit down long side of chiles. Remove seeds and membranes, trying not to tear chiles. 4 of 7 Cut cheese into 16 thin slices. Tuck 2 slices into each chile and secure opening with toothpick. 5 of 7 Beat whites, salt and cream of tartar to stiff peaks. Fold in yolks. 6 of 7 Heat oil in a large skillet over medium-high heat. Dip one chile into egg mixture, then transfer to hot oil. Repeat with two to three more. Cook about 4 minutes, turning on all sides. Repeat with remaining chiles, keeping cooked chiles warm in 200 degrees F oven. 7 of 7 Heat enchilada sauce in a small saucepan or in microwave. Transfer hot chiles to a serving platter and top with sauce and sour cream, if desired. 1 of 1 To save time, use canned whole green chiles instead of prepping your own. Per Serving: 1 g fiber, 6 g sat. fat, 203 kcal cal., 215 mg sodium, 81 mg chol., 17 g Fat, total, 6 g carb., 7 g pro.